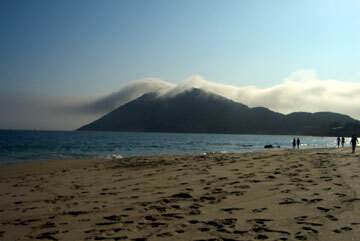 San Francisco beach is one of a number of beaches between the coastal town of Muros and the massive 7km long beach at Carnota. It is very popular. What makes San Francisco different to many of the other beaches in the area is that immediately behind it you have hotels, bars and restaurants. This means that you can stroll off the beach at any time for a drink or a snack, and it also means that many holiday makers are staying very close to the beach. 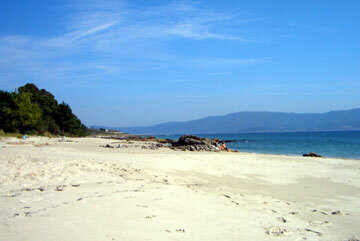 This is not typical in Galicia. This photo shows a true reflection of the sand colour. The other pictures are looking into the sun later on in the day and I photoshoped them to lighten things up. The result of all of this is that San Francisco is one of the busiest and most popular beaches in the la Coruna province, and in August and during holidays it really does get packed with sun worshipers. In terms of amenities, the beach has showers, a boardwalk or promenade running just above it, and a small car park. Additionally, there is road side parking for a couple of kilometres along the beachside, so finding somewhere to leave the car is rarely a problem. You will also find ice ream kiosks just behind the beach and we have seen lifeguards there in July and August. Left, this photo was taken looking into the sun as a sea fret was approaching. These frets can be small and come and go quickly, or they can cover tens of kilometers. The beach itself is fairly long and narrow, but it is broken up by rocky outcrops that protrude from the sand dividing the beach into a series of smaller areas. You can easily walk over these rocks to get from one part of the beach to another. The sea is very clear, but also has some areas with rock formations. The sand at San Francisco is very fine and white and to one side of the beach you will see Monte Louro (a small mountain). All told, both the beach and its surroundings are very attractive and this no doubt accounts for much of its popularity. For our part this is a beach that we have been to quite regularly, but always outside of the main Spanish holiday season. On a beautifully sunny weekend in August 2014 we drove past San Francisco beach and it really was packed with bathers. That's fine if you like busy beaches, but we prefer a little bit more seclusion, so we stay away from San Francisco during the height of summer.